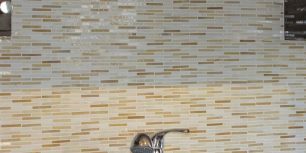 Glass back splash in remodeled kitchen. Condo Remodel in Washington, D.C. Kitchen pass through to the Dining area. 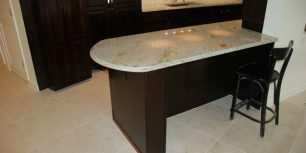 Kitchen island with new sand stone floor (part of a two bedroom condo remodeling project in Washington, D.C.). This kitchen remodel was part of a complete renovation of a 2 bedroom condo located in the Watergate South building in Washington, D.C. The scope of work consisted of a complete new kitchen layout including cabinets, appliances, granite tops and lighting. We then moved on to the guest bedroom where we gave the existing full bath with a tube a new look, with new fixtures, glass shower door and lighting. The master bath was entirely remodeled. 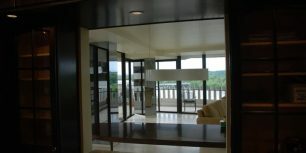 To finish off the dining and living room areas, we added recessed lighting, a new gas fire place and finished off the project with a new sandstone tile floor throughout the apartment, which overlooks the Potomac and the Kennedy Center. As part of a total renovation of a 2 bedroom condo in N.W. 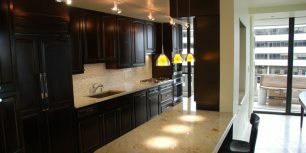 Washington, D.C., we did a complete new kitchen layout including cabinets, appliances, granite tops and lighting. 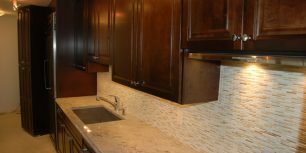 As part of a complete renovation of a condo overlooking the Potomac, our remodeling of the kitchen consisted of a complete new kitchen layout including cabinets, appliances, granite tops and lighting.